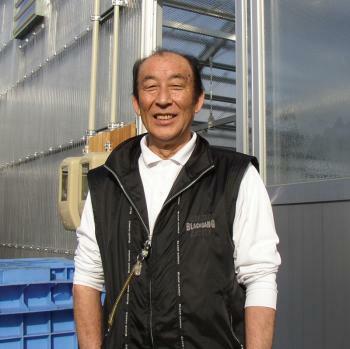 Mr. Haruo Aoki,born in Iketani of Yamakoshi Village, the birthplace of Nishikigoi. The creation process of Kikokuryu. It was 1993. 10 years ago, I crossbred a male Kumonryu with a female Kikusui. At the time, “Kikokuryu” appeared. When the Kikokuryu became three years old, it won “Best-in-Variety” at the All Japan Combined Young Nishikigoi Show. My Beni Kikokuryu has “cinnabar red.” my Beni Kikokuryu is characterized with a deep red hi. It is also from a Kumonryu. Kikokuryu simply has sumi on platinum. But by crossing a Kikusui with a Kumonryu, “the red of the Kikusui” came out. Koi without red became Kikokuryu whereas koi with red became Beni Kikokuryu.